All rights reserved. No part of this publication may be reproduced, stored in a retrieval system, or transmitted in any form or by any means, electronic, mechanical, photocopying or otherwise, without the prior permission of the copyright owner. Applications for such permission, with a statement of the purpose and extent of the reproduction, should be addressed to the Director, Publication Division, Food and Agriculture Organization of the United Nations, Via delle Terme di Caracalla, 00100 Rome, Italy. A Technical Consultation on New Feed Resources was held at FAO Headquarters, Rome in 1976. This Consultation paid special attention to the potentialities of poor quality roughages derived from agriculture, the quantities available, and the improvement of the nutritive value of such roughages by the use of physical, chemical and biological methods. Attention was also given to agro-industrial by-products such as molasses, pulps, processed cassava and potato residues, oilcakes, milling by-products, etc. along with the by-products of wood and the cellulose industries and to the recycling of animal wastes. In order to support studies on increasing the rate of utilization of crop residues and agro-industrial by-products in animal feeding in Africa, the Animal Production and Health Division of FAO, in collaboration with several research institutes in that region, such as those in Cameroon, Nigeria and Senegal, set up in 1978 a network on the subject of West Africa. This network was to assist the activities being undertaken in connection with this subject in African countries and to promote the exchange of research experience and other related information between African countries. To support the African network on better feed utilization, FAO in 1981 in collaboration with the International Livestock Centre for Africa (ILCA) organized the FAO/ILCA Workshop on Crop Residues and Agro-Industrial By-Products in Animal Feeding, at Dakar, Senegal. About 40 scientists from 15 different African countries attended this workshop. The Workshop made many recommendations and laid down guidelines for the future activities of the African network. It stressed the importance of appropriate support and encouragement being given to the scientists undertaking research work on the subject at various institutes in different countries of Africa. The Dakar Workshop of 1981 made a recommendation amongst others that an Expert Consultation should be organized in order to establish guidelines for research on crop residues and agro-industrial by-products and that this consultation should produce a booklet in which would be described the detailed methodology employed and which would contain a compilation of all the known appropriate methods of analysis. In 1983, the Animal Production and Health Division of FAO included this Expert Consultation in their regular programme budget for the period 1984–1985. As the subject features prominently in the programme activities of ILCA the Director, Dr. Brumby, expressed interest in collaborating with FAO in organizing such an Expert Consultation at ILCA Headquarters in Addis Ababa, Ethiopia. 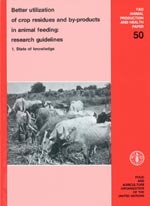 In the autumn of 1983, the Animal Production and Health Division of FAO sent a consultant (Dr. Preston) to review the present situation on research being undertaken on the utilization of crop residues and agro-industrial by-products in selected African countries, namely Cameroon, Nigeria and Senegal, and to ascertain how ILCA experts could cooperate in such research work. Dr. Prestor's findings will serve as a background paper for the expert Consultation. to make recommendations and set down guidelines for research on crop residues and agro-industrial by-products for the guidance of research workers in developing countries in order that useful results can be achieved from their work. As a followup for the FAO/ILCA Expert Consultatior a report which summarizes technical matters and recommendations presented and discussed during the Consultation, has already been published at FAO headquarters, Rome in April 1984. The present publication “Guidelines for Research on the Better Utilization of Crop Residues and Agro-Industrial By-Products in Animal Feeding in Developing Countries. Vol. 1. State of Knowledge”, (Proceedings of the FAO/ILCA Expert Consultation held 5–9 March 1984 at ILCA Headquarters, Addis Ababa, Ethiopia) contains technical background papers presented at this Consultation. “Vol. 2. A Practical Manual for Research Workers” is under preparation. It will give guidelines for the future research which may lead to far-reaching developments as far as the utilization of crop residues and agro-industrial by-products as livestock feed are concerned. Although FAO activities in this subject area have until now been mainly focused on Africa as is shown by this Expert Consultation, FAO recognizes the problem as worldwide. In fact, many FAO activities on this subject, have been and are going on in many countries of Asia, Central America and the Caribbean. FAO wishes to express sincere thanks to ILCA for the valuable assistance it has given in the organization and holding of the Consultation. FAO is very grateful for the valuable inputs of the participating scientists which made the Consultation a great success.